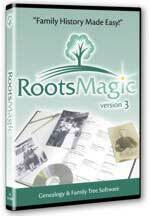 The Windows genealogy software package, RootsMagic 3, has been updated to version 3.2.2. RootsMagic retails for $29.99, and runs on Windows XP, 95, 98, ME, NT, and 2000. This is just a minor update. FTM “family notes” now import properly when doing direct FTM import. Other minor tweaks were made to the application as well.